Some speculate the amendment could extend Xi's time in office, or codify his anti-corruption efforts into one body. China is discussing revisions to its constitution — something that could give current President Xi Jinping more time in power. Xinhua reports the proposal to amend part of the constitution was decided on Wednesday. The details on possible amendments aren't clear, but the Communist Party's Central Committee will reportedly discuss the proposal next month. If it goes through, it would be the first change to the constitution since 2004. 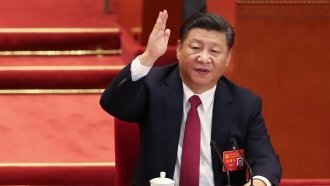 This news adds to the speculation that President Xi will try to stay in office beyond the constitution's current limit of two five-year terms. Others speculate the amendment would codify a national supervision commission, which would integrate anti-corruption efforts into one body. Both moves would benefit Xi, who already enshrined his name and ideology into the Communist Party's constitution back in October. With that legacy, and the fact that Xi hasn't even named a successor, the Chinese president may be starting off 2018 by further tightening his hold on the country.